I was planning what sort of filters I will be using for the 14 breeding tanks I'll be having. The thought of a central sump came to mind. But then disease outbreak will be a disaster. At first I was thinking of using one of those cheap internal filters powered by an air pump; I used them before on my 45cm and it works wonders. The media they give, I'll switch to Substrat Pro or perhaps Biohome. It has worked for me in my other two tanks before. Felix of AQ then reminded me of a filter that I happened to read about on Aquatic Quotient sometime in mid of the year. I totally forgotten about it. I went on to research further, how it works and what sort of benefits it'll provide. Felix told me that Green Chapter (GC) uses this sort of system too. The construction is easy peasy. Here's what I used. In Singapore, they don't sell those really fine pads. I had to settle with Ocean Free. Do take note if you are going to get the pad, try to find those fine ones and not those porous type. It should be 5cm minimum in thickness. If you can get you hand on Poret. Import it. If you buy a lot, like for breeding tanks, then you can tell them to cut for you in size. Poret Pads - Check them out! 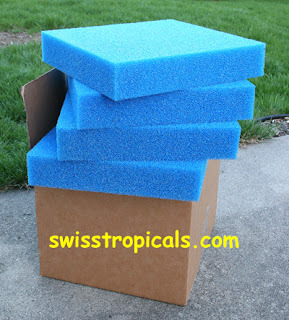 Pictures from Swiss Tropicals that sells Poret Pad. I gotten the grey 16mm pvc pipe. Meant for plumbing. I was thinking of the black pvc pipe meant for electrical. But I was concern as I wasn't sure if they have added anything to it. I'm no chemist but sometimes I find the internal part of the black pvc having a powdery substance. It could just be coincidental but since the pvc will be hidden from view, colour was not important. BuyandFix (For Singapore) - You get your DIY stuffs from here! Buy or borrow from a friend a pipe cutter like this. I already have like what 10 meters of this tubing that I keep. I prefer using the black ones. 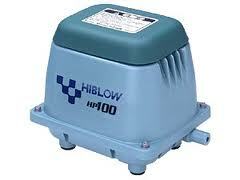 Now, base on advice on the web, you can either use an internal water pump (small one) or an air pump. The guideline, it must be x2 of your tank. Meaning, if it's 20 liters, then you need a pump that's x2. (40L/Hr) I'm not too certain for air pump. Water pump sure. Air pump, get something big. I was recommended the HiBlow. But man! The price of this pump can get you a chiller!! But it's definitely a good pump. One pump and it can supply to a number of your tanks without losing any "strength" So on a low budget, I settled on the existing air pump that I have. Output unsure. It's a Dymax AP700. Dual outlet. Right, so first, cut the pad to width and height of your tank. Cut a square on the top. This is where your PVC Elbow will sit. Keep the pad you cut off. This portion, you may cut it a little and put it back after placing the elbow. It'll look "neater"
Cut the pvc pipe to size. Not too short; not too long. The height from bottom of tank to the bottom of pvc pipe; just make it 2cm. Now, this depends on you. I have yet to research whether using an air stone or just the tubing is better. The obvious difference, smaller bubbles comes out using an air stone while just using the air tubing alone; the bubbles is bigger. In terms of "power" I don't see any difference. Drill a hole, slightly smaller in diameter of your airtube. Without air stone, just drill roughly 2cm of the pipe. Insert the tube. Do not pull it out of the pvc pipe. It must remain inside the tube. If you are using an air stone, it must be small to be inside the pipe. Drill a hole somewhere in the middle of the pvc. Insert tube till it comes out at the end of the pvc pipe. Pull it out. Insert the air stone and pull the tube so that the air stone goes into the pipe. Do not pull it all the way. The air stone should be all in but just sitting about 1cm from the opening. Attached the end of tube to the pump. Place the elbow. Rest the elbow on the pad where you cut the "square". Place the square cut pad on the elbow to cover it. Adjust and make it flush. I placed the water level at half the pipe or just 3/4 of the pipe. 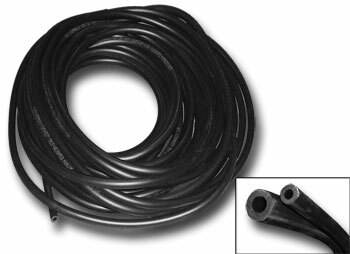 Now, make sure the length of the airline tubing from pipe to pump is not too long. Try to make it as short as possible if you are using a cheap pump like me. Like any other tanks, cycle it. By the 3rd-4th week, test the water parameters. Once it's at the desired level, add fauna. FYI, there are other "design" to this, some use it as a corner filter. Some even use it as a bottom filter. I did not go into why this filter is good or how it work; no one explains it better then this website. The author is unknown; some German guy but Jan Rigter has kindly translated it into English. Please check it out and research further on how other hobbyist did theirs. Dear readers, please be informed that the blogger do not endorse any advertising that anyone might post in the comments. That goes for the comment by reader Likoma. Blogger would only endorse those that he have puchase successfully from either locally or online, known about and has been purchase by friends successfully and will only recommend those he have build rapport with. Therefore, please take precaution when purchasing products online. I know how frustrating sometimes that it is difficult to get the product such as Poret in our own country but caution must be exercise. To Likoma, no offence. I don't wish for any misunderstanding. It would have been more appropriate if you had approach me personally on linking to your biz site.